Vultures have a deserved reputation as scavengers, but they have other defining characteristics that are just as distinct. These birds of prey come in a variety of species that share common physical and behavioral characteristics, which make them easily recognizable on all five continents on which they live. Typically large and robust, these unscrupulous creatures play a valuable role in the ecosystem by disposing of animal waste that would otherwise rot and spread disease. Vultures come in different species -- 21 or 22, to be exact. They're divided into two main categories: Old World vultures and New World vultures. The former resemble hawks and eagles, with large talons built for grabbing and a habit of building nests. The latter, on the other hand, lay their eggs in holes and unoccupied trees and have physical differences such as longer nostrils. Old World vultures typically live in Europe, Asia and Africa; New World vultures live in the Americas. No matter the species, vultures share certain distinctive physical characteristics. The most notable, perhaps, is size -- vultures boast large wingspans, which they exploit to glide through the air and patrol for food without having to flap much. By gliding on rising air currents, they can reach altitudes that give them an excellent vantage point for scoping out potential meals. They all also have sharp beaks that are hooked on the end, which they use as tools when eating. Finally, all vultures have bald, featherless heads, which allow them to feast on decaying animals without bacteria getting trapped in their feathers. 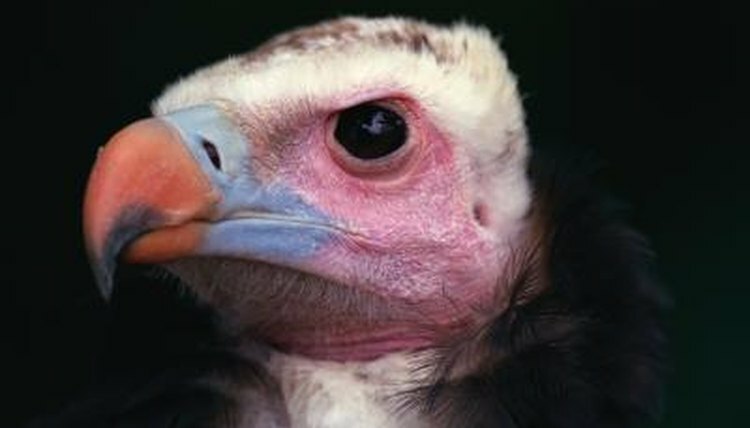 While they sometimes feed on defenseless animals like newborns and the wounded, vultures are primarily scavengers, patrolling the skies in search of dead animals they can eat. Because they have well-developed immune systems, they can eat rotting flesh without the risk of disease that would threaten other animals -- in that regard, their eating habits prevent the spread of bacteria from festering corpses. Because they're dependent primarily on luck, vultures eat what they can, when they can. They habitually gorge themselves, sometimes to the point of having difficulty flying immediately after a meal. Vultures can live to be 70 years old, but they don't spend that time mating indiscriminately -- once partnered, vultures stay with their mates for life. Vultures live in groups, and when they pair off and mate, the male and female are monogamous. The males assist the females in incubating the eggs and caring for the chicks, regurgitating food from a special pouch in the throat to feed their young.